Ho! Ho! Ho! Santa is on his way! 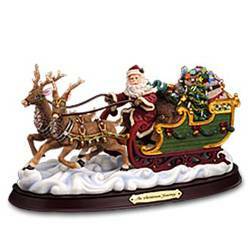 The Christmas Eve Journey features Santa in his sleigh loaded with packages for all the good girls and boys. Tune: "The Christmas Song". Size: 5.5 L x 11.0 W x 6.0 H.